Fashion — what the Elle is she up to? Amazon Fashion Does It Again! Ya’ll, I have been LOVING my amazon finds lately. This classic black turtleneck is less then 20.00 and a total steal! It comes in SO many colors! I like mine a bit baggier so I went with a large. Find it here. I’ve paired with the racer striped jeans (similar pair found here) and a simple, wedged black heel. It’s finally fall, ya’ll!! I couldn’t be more excited to be shopping for cozy sweaters with something pumpkin flavored in my hand. This H&M sweater is less than 30.00 and comes in so many beautiful colors. (Mine is the dark Beige in size Small) I’ve paired it with a pair of black skinnies (btw these are amazing and totally worth every penny) and my favorite black loafers….and a pumpkin spice latte. (: Happy shopping! 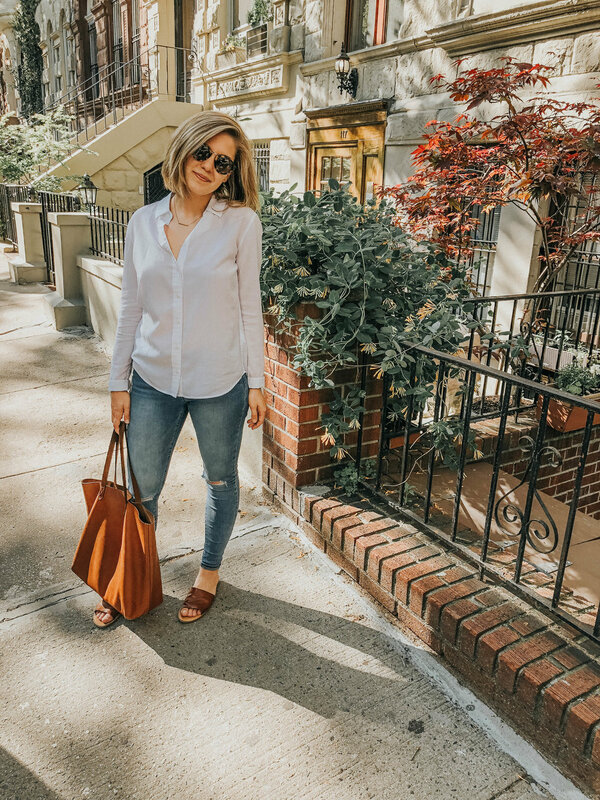 I’ve been on the search to find great basics for my closet and Amazon has been my go to for fall fashion. Between the two day prime shipping and their easy (usually free) returns it’s a simple way to find the perfect must haves for your closet. This white blouse was less than 20.00 and the perfect basic to pair with anything. Also, it’s machine washable. I’ve paired it with white shorts, blue jean jacket and gladiator, aerosoles sandals (highly recommend for traveling). I’ll be sharing a lot more of my amazon overhaul finds for my fall closet! Stay tuned. Fall is full of beautiful little details for me and I am so happy to be pulling out the big sweaters with pair of ripped skinnies and loafers. That’s definitely my sweet spot in fashion. Madewell keeps my closet stocked with accessories including their ever perfect, camel colored sweaters. These loafers are some of my faves from The Belgian Shoes paired with gold accessories and of course my skinnies and a plain white tee. My tee is from A.Lynn Designs and if you haven’t already go check out their site for amazing custom styles with the softest material. I love an amazing French brand and Bensimon takes the cake. They're a wonderful brand specifically known for their sneakers but their apparel is amazing as well, as is this little white dress! Wearing a little white dress with a denim jacket is my favorite go to outfit. 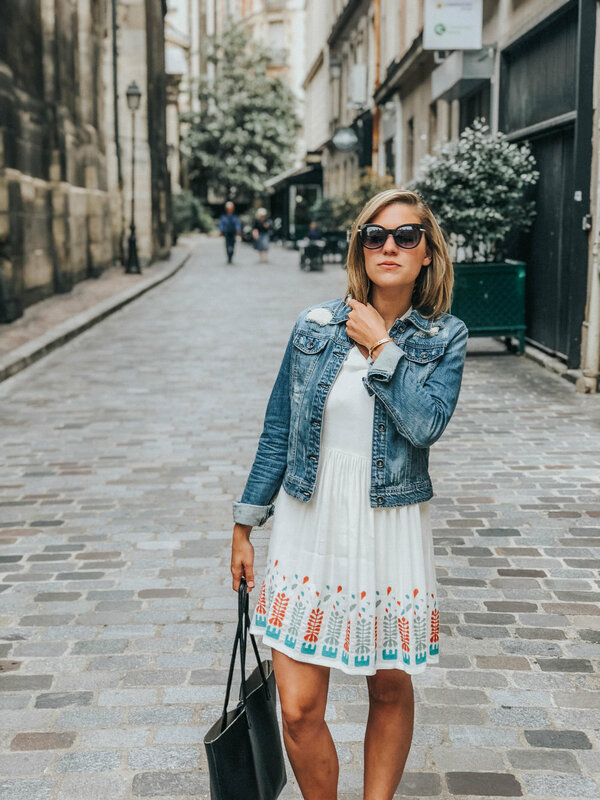 As Bensimon does not ship internationally, I've linked another white dress that I love but have a look over their website and check them out when traveling abroad! Tap the photo for another white dress option that I love from Lulus under 60! 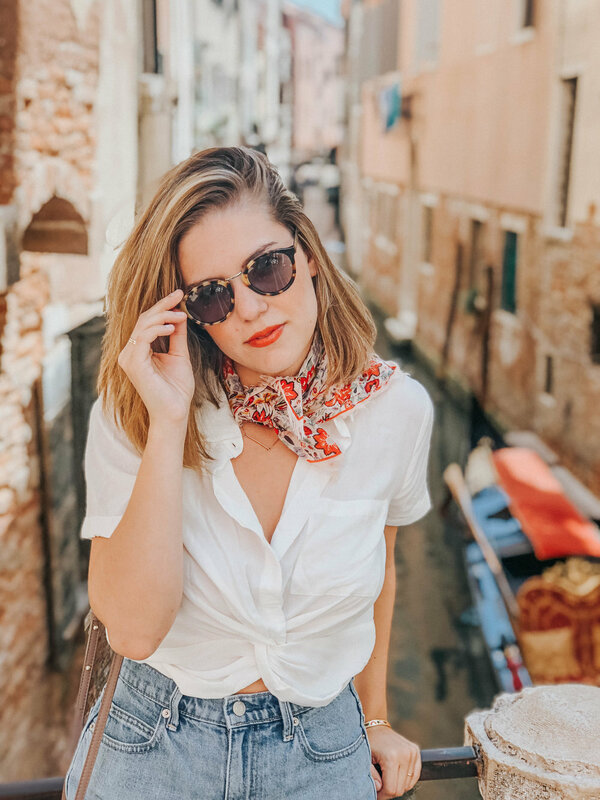 I've always been a fan of Madewell/JCrew but their accessories are my go to when traveling. Madewell brand and styles are appropriate for all travel and keep me looking chic and put together. I love this little neck scarf that can double for a hair scarf when I don't have time to wash my hair. These sunnies are classic and the tortoise shell makes them perfect for any outfit. I've paired with one of their classic bracelets, denim shorts, and a white blouse. (linked below). Also, don't forget to check out their amazing leather line. Their totes are my all time favorite! As I'm traveling through Europe over August I wanted to pack things that would make me feel more like a local. These shorts from Abercrombie did not disappoint and I love that they always have sales. Click the photo to find a similar pair. The best and softest white tee in the game and completely customizable. You can chose the length and the exact fit of all clothes with a simple starter kit. There is an array of amazing fabrics to chose from with the softest material. This tee is a must have staple in every closet. Use my code WTElle25 for 25% off your first purchase! Check them out below! And of course, you knew it was coming, the link to my all time, favorite pair of Keds. These Kate Spade Keds are absolutely gorgeous and the perfect match to just about any outfit. Click the link to buy yours today and support this made by women, for women brand. "Ladies first since 1916." If you have the opportunity to shop store front- prepare for the best customer service experience ever- it is a literal dream shopping here. I've paired it with my original, white Keds and Madewell sunnies. A weekend in the Hamptons is just what the doctor ordered and this beautiful blue swimmie was the match made in heaven. This high wasted royal blue suit is perfect for just about any swim occasion. It is super comfortable and very functional. The best part about this Urban Outfitters suit is that it's on sale right now, as is most of their swimwear. Tap the photo to shop more. This pure white button down from Uniqlo is the absolute best staple for your closet. Uniqlo is known for having super light weight clothing made from the finest materials. This light weight button down is unbelievably wrinkle proof and is low maintenance cleaning. Click the photo to check them out. I've taken a bit of inspiration from Megan Markle and paired it with a simple ripped denim from Old Navy, my classic Madewell tote, and Steve Madden leather slides. Check these super cute cut off denim shorts. They're the perfect length to show off all of those squats you've been doing through the winter but still keep that booty in check. Click the photo to find my favorite pair from Zara. I've paired it with a basic pink tee from...wait for it, WALMART! Seriously, this 5.00 tee is the softest and perfect summer must have. Also added my favorite Madewell tote with Steve Madden sandals. I've paired it with a light sweater from H&M with a denim button down and black skinnies. Shoes are Ugg that I've linked below. I absolutely love these shoes and totally worth the investment! They're the perfect walking shoe while also keeping it trendy. These high wasted shorts from Gap are the best summer must have! But, better yet! All of Gap's Denims are on sale!! Just click the link and shop away! I've paired these with a black ribbed v neck from Urban Outfitters and romwe slides. You can find slides similar below. Happy summer shopping, loves! This little blue denim is the perfect lightweight jacket as we move into spring and summer. Even better though, I found this piece at my favorite local boutique Shi Shi located on both the upper west and upper east side. Click the picture and browse their selection and better yet, go visit in person! They give the best personalized service and I always walk out with a new, unique piece and lots of confidence thanks to those ladies! They will make you feel like a million bucks every time you're there. This look is paired with my same black skinnies from Free People (see below), white keds, basic striped tee, and black tote. Stay up to date with new arrivals at Shi Shi by following them on facebook.